A while back we stopped at a little country restaurant sitting just off the interstate after visiting our favorite outdoor flea market. My husband is a big fan of traditional country cooking, or cookin', and decided on the fried chicken after it was recommended by other diners. After a couple of minutes of not only watching, but listening, to him devouring his chicken I asked him if they needed to get a room. He looked up, still holding a chicken leg and asked what me what I was talking about. I responded he may want some privacy since he was making out with his chicken. And the phrase 'make out chicken' became not only an inside joke, but a standard on which he would judge all other chicken. Fried chicken is not something I make very often. I've found that it's difficult to get right and it's also pretty hard to beat the KFC that's right down the street. I spotted this recipe for brining the chicken first and decided it was worth a shot. Just after picking up the ingredients, Ina Garten featured Thomas Keller's fried chicken on her show and the technique, and most of the ingredients were the same so it seemed like the universe was encouraging me to do this. If you haven't brined meat before I encourage you to do so. Pork chops, turkeys, and now chickens have all marinated in a brine bath in my fridge and the results are always pretty much awesome. Something about the brine helps flavor the meat while keeping it juicy. It takes a little time, but is easy and pretty much fool-proof. So how did Lemon Marinated Fried Chicken measure up against make out chicken? I don't think there was any contest. Both my husband and daughter said it was the best fried chicken they had ever had. The breading was perfectly crisp and the chicken was moist, tender, and full of flavor. Move over make out chicken - there's a new bird in town! 1. If chicken breasts are large, cut them in half. In a large pot, combine 4 cups water, salt, sugar, lemons, garlic, bay leaves, pepper, and thyme for brine. Bring to a boil, and remove from heat. Add ice, and let cool completely. 2. Add chicken pieces to brine, and refrigerate for 8 hours or overnight. Remove chicken from brine, and pat dry with paper towels. 4. In a large shallow dish, stir together flour, garlic salt, onion powder, and pepper for breading. In a large bowl, whisk together buttermilk and eggs. 5. Heat a large cast-iron Dutch oven over medium heat. Fill about halfway with peanut oil; heat to 360° on a deep-frying thermometer. 6. Dredge chicken pieces in flour mixture, then dip in buttermilk and dredge in flour mixture again. Coat and fry larger pieces first so they can continue to cook in the oven. 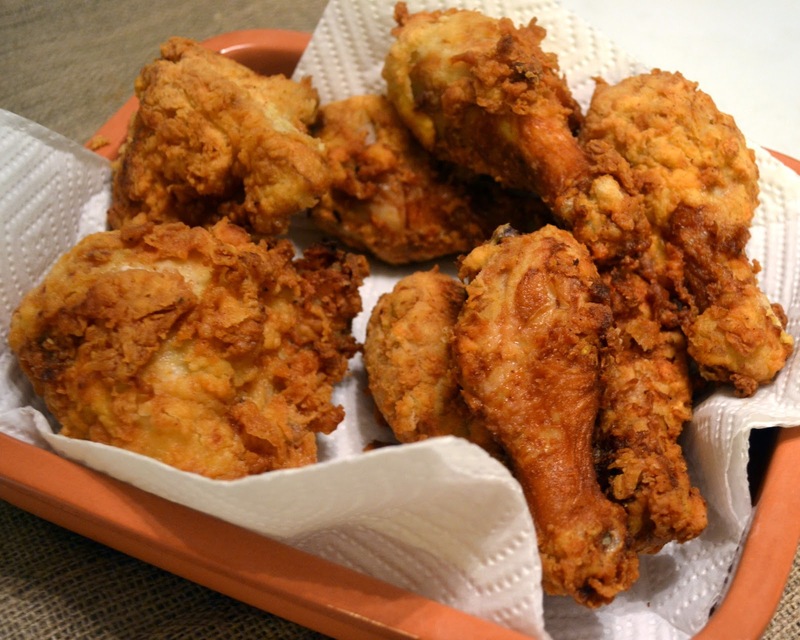 Lower chicken into oil, and fry in batches until brown and crisp, approximately 6 minutes. Transfer to a baking sheet with a cooling rack set over it, and place in the oven to continue cooking. Chicken is done when an instant-read thermometer inserted in the center of breasts registers 165°, approximately 10 to 15 minutes. I tried Thomas Keller's high-heat method for roasting a chicken, and now it is my go-to recipe for good. He is amazing! I know he is mainly known for 'fancy food' but his simple yet effective techniques for American classics can't be beat! I am somewhat intimidated by the splatter factor of fried chicken, but this looks so good I will have to get over my fear. I have never brined anything but I think it is time. Is "brined" even a word?